Will Samsung unveil a Galaxy Note 3 variant with an unbreakable flexible OLED display? Update: Apparently two Samsung officials confirmed those reports. First up was mobile strategic marketing chief, D.J. Lee that said that a new phone with a curved display will be introduced in South Korea in October. Park Sang-jin, Samsung SDI's CEO told reporters that the new device will use a plastic OLED display. Samsung launched the Galaxy Note 3 earlier this month, with a 5.7" Full-HD Super AMOLED display (386 PPI). Before this launched we heard many reports that the Note 3 will be the first phone to sport a plastic-based unbreakable flexible YOUM display. Some of these reports came from credited sources such as the OLED Association. One of the more interesting reports suggested that Samsung is actually preparing several Note 3 variants, each with a different display. A regular AMOLED will be the most popular one, but Samsung may use an LCD in some variants (this is probably because AMOLED supply may be very tight). Today Korean news site Chosun posted that Samsung will announce a new premium-edition Galaxy Note 3 phone on October 25 - with a YOUM display. It makes sense for Samsung to use YOUM panels in a limited-edition premium phone at firs as flexible OLED supply will be very limited at first. Some suggest that Samsung will only be able to make a few hundred-thousand 5" panels a month at first. At any rate, we only have a month to wait before we can verify this one. The Galaxy Note 3 - so will it sport a plastic-based AMOLED display? Samsung to release two Note 4 variants, one with a curved display? 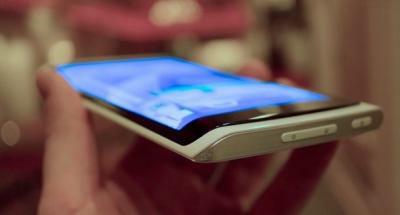 Will the Galaxy Note 2 feature a plastic-based flexible OLED display? The Galaxy Note 4 has a 5.7" QHD Super AMOLED display, and a curved-edge variant! Will Samsung release a Galaxy Note "lite" with a 5.55" HD Super AMOLED?